Natural gas has been a tough one to trade for a while now. 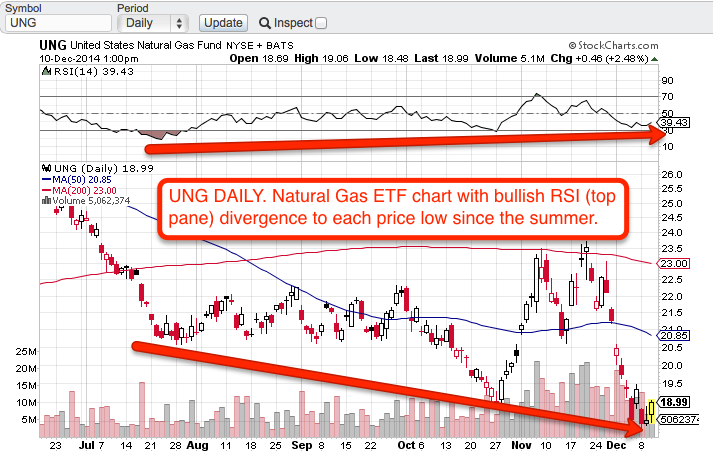 But I am fortunate to have taken down some big winners in the UGAZ, triple-long natural gas ETF, in many instances over the past year or two due to disciplined trading, technicals, and strict stop-loss adherence. With this in mind, I went long UGAZ at $9.04 with a protective stop-loss below $8.60. I placed 4% of my trading portfolio capital into the position. There is the EIA Natural Gas Report at 10:30 am EST tomorrow morning, which makes trading the position tricky. I do expect volatility. However, the daily chart for UNG, the straight-up ETF, below, shows a bullish RSI divergence to price. The RSI divergence means that downside momentum is abating with each new price low. Moreover, since I sold UGAZ for a nice win several weeks back, natty has essentially swooned lower and is only now showing signs of potential stabilization just as sentiment is flipping quote bearish, again. So, this one is more of a contrarian trade than the last UGAZ long I put on. I am swimming with sharks again on this trade. But if you have followed me for long enough you know that I often head into those waters on purpose...and with a clear purpose.